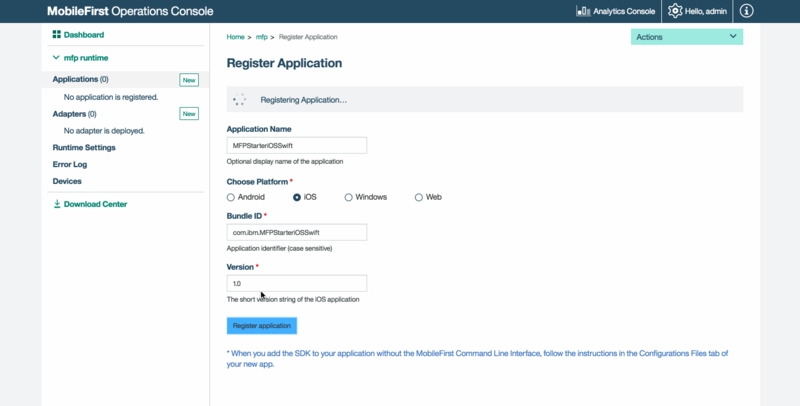 A sample application that is pre-bundled with the MobileFirst client SDK is registered and downloaded from the MobileFirst Operations Console. 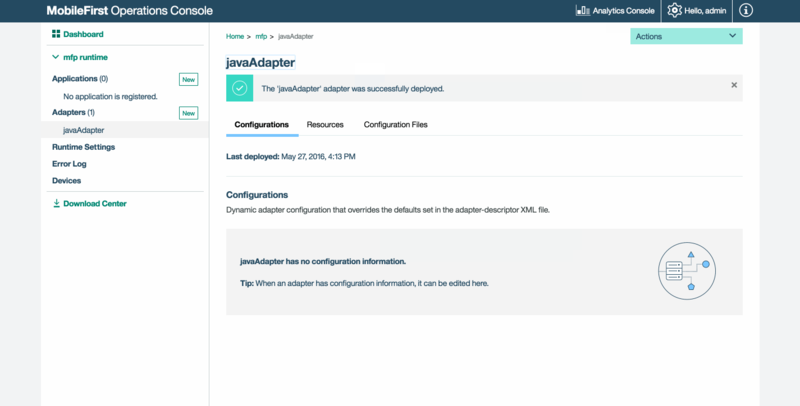 A new or provided adapter is deployed to the MobileFirst Operations Console. The application logic is changed to make a resource request. Successfully pinging the MobileFirst Server. Successfully retrieving data using an adapter. If using the MobileFirst Developer Kit, navigate to the server’s folder and run the command: ./run.sh in Mac and Linux or run.cmd in Windows. In a browser window, open the MobileFirst Operations Console by loading the URL: http://your-server-host:server-port/mfpconsole. If running locally, use: http://localhost:9080/mfpconsole. The username/password are admin/admin. Click on the Get Starter Code tile and select to download the iOS Objective-C or iOS Swift sample application. Open the Xcode project by double-clicking the .xcworkspace file. // Will print "Hello world" in the Xcode Console. connectionStatusLabel.text = "Connecting to server...\n\(serverURL)"
self.connectionStatusLabel.text = "Failed to connect to MobileFirst Server\n\(serverURL)"
self.connectionStatusLabel.text = "Connected to MobileFirst Server\n\(serverURL)"
Download this prepared .adapter artifact and deploy it from the MobileFirst Operations Console using the Actions → Deploy adapter action. Alternatively, click the New button next to Adapters. Select the Actions → Download sample option. Download the “Hello World” Java adapter sample. If Maven and MobileFirst CLI are not installed, follow the on-screen Set up your development environment instructions. When the build finishes, deploy it from the MobileFirst Operations Console using the Actions → Deploy adapter action. The adapter can be found in the [adapter]/target folder. In Xcode, select the mfpclient.plist file and edit the protocol, host and port properties with the correct values for your MobileFirst Server. If using a local MobileFirst Server, the values are typically http, localhost and 9080. If using a remote MobileFirst Server (on IBM Cloud), the values are typically https, your-server-address and 443. If using a Kubernetes cluster on IBM Cloud Private and if the deployment is of type NodePort, the value of the port would typically be the NodePort exposed by the service in Kubernetes cluster. Alternatively, if you have installed the MobileFirst CLI, then navigate to the project root folder and run the command mfpdev app register. 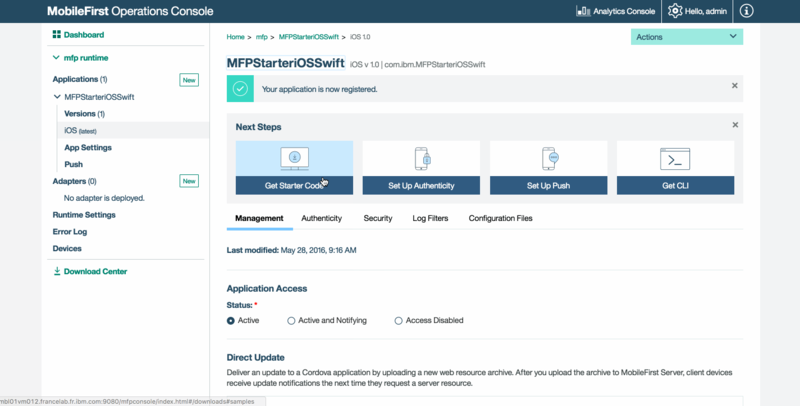 If a remote MobileFirst Server is used, run the command mfpdev server add to add the server, followed by for example: mfpdev app register myIBMCloudServer. Clicking the Ping MobileFirst Server button will display Connected to MobileFirst Server. If the application was able to connect to the MobileFirst Server, a resource request call using the deployed Java adapter will take place. The adapter response is then printed in the Xcode Console.